I’m always looking for new ways to decorate cupcakes, and when I came across a photo of these, I decided they were too cute not to make. I was looking for something autumnal and had done various searches on the internet before I discovered them. Finding the ingredients to make them was the trickiest part – I think I had to empty 12 tubes of Smarties before I found enough red ones to make the toadstools and even then I didn’t have enough to make one to go on each cake as planned but I decided that if I went back to the Co-op to buy a third lot of Smarties they might start to ask questions so I left it! 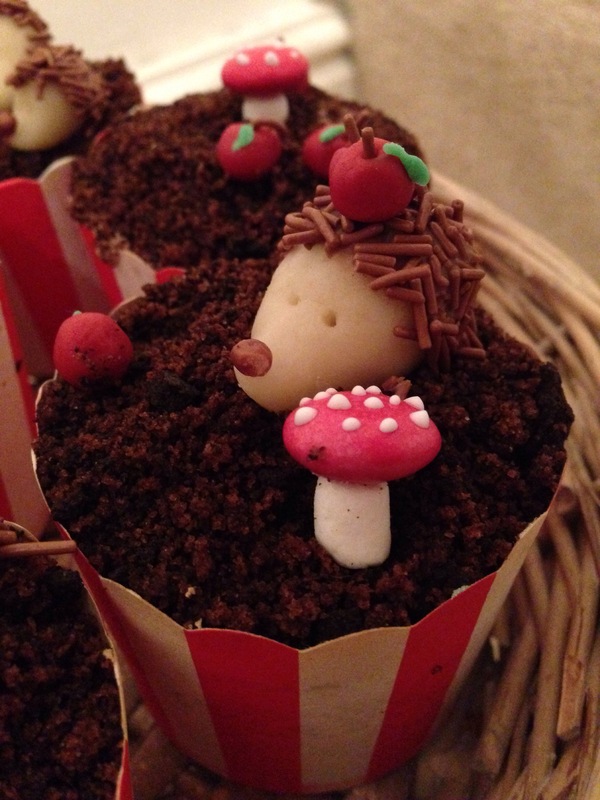 To make the toadstools, dip a cocktail stick into the royal icing and then make small dots on top of the Smartie. Dip one end of a micro marshmallow into the royal icing and stick to the other side of the Smartie. 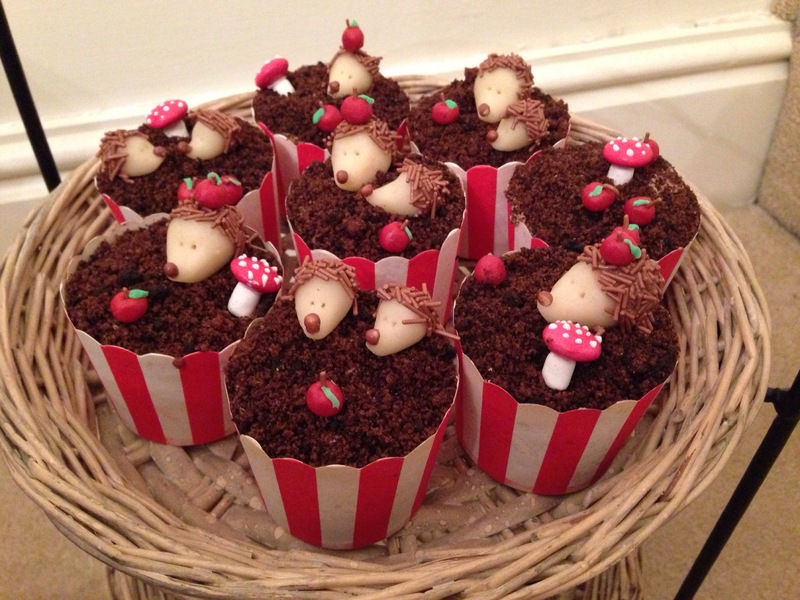 To make the hedgehogs, take a small piece of marzipan and shape into a cone. Turn up the pointed end to form the nose. Using a cocktail stick, make two small holes for the eyes. Colour the remaining royal icing with brown food colouring or cocoa powder and then holding the hedgehog by the nose, dip the body into the royal icing and then into the sugar strands. Using a cocktail stick place a small dot of royal icing on the tip of the nose and then stick a small crispie ball on. Place on a tray to dry. Shape the red icing into small balls to form apples and stick a sugar strand into each one as a stalk. Finish off with some leaves made out of a mall bits of green icing. I made hot chocolate flavoured cupcakes, topped them with hot chocolate buttercream. 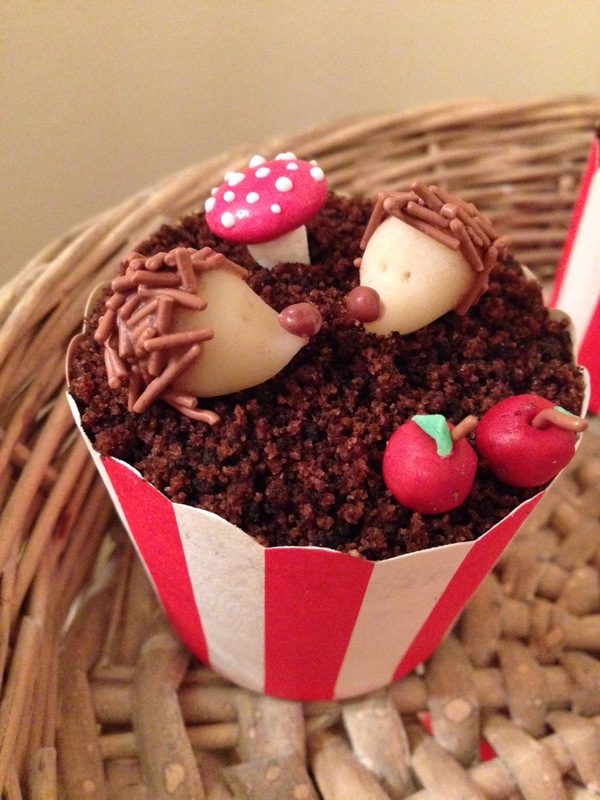 To make the soil I put a couple of cupcakes into a food processor and blended until they were crumbs. I then mixed this with crushed Oreos to make it a bit darker.